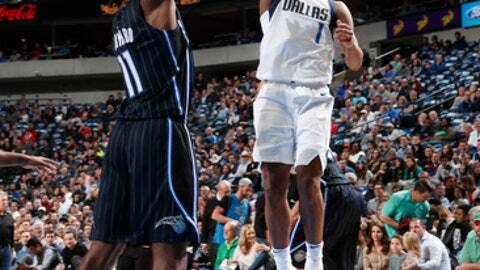 DALLAS (AP) Dennis Smith Jr. and Yogi Ferrell helped set the pace for the Dallas Mavericks in their 114-99 win over the Orlando Magic on Tuesday night. The 6-foot Ferrell led the team with eight boards, the 6-3 Smith had seven and the Mavericks used that spark to get offense going the other way. Ferrell said it was a result of the rest of the team boxing out, and he just benefited by grabbing the ball. It also led to a balanced scoring output for Dallas. Dirk Nowitzki and Smith each scored 20 points as the Mavericks stopped a three-game slide. Wesley Matthews had 16 points for Dallas, which got its first win since Dec. 31 against Oklahoma City. Harrison Barnes and Ferrell scored 15 apiece, while J.J. Barea had 12 assists and eight points. Carlisle earned his 708th career win, moving past John MacLeod for 17th in NBA history. Next up is Gene Shue with 784. Aaron Gordon scored 19 points for Orlando, which has lost five in a row. D.J. Augustin had 18 points, and Marreese Speights finished with 13 points and 10 rebounds. The Magic have allowed at least 100 points in four of their last five games and have lost 14 of 15. The Magic led 48-43 at halftime, but Nowitzki and Smith helped the Mavericks rally with 15 points apiece in the second half. With his team leading 66-64 and 4:04 remaining in the third quarter, Ferrell made a pull-up jumper and Barnes followed with another jump shot. The Mavs carried an 82-75 lead into the fourth. The Magic pulled within four in the final period before the Mavericks closed the game with a 14-3 run over the final four minutes. Dallas shot 51.8 percent from the floor. Orlando shot 45.6 percent and had 13 turnovers in a sloppy offensive performance. Gordon didn’t start after he violated team rules. Vogel didn’t elaborate on what rule, but Gordon indicated it had to do with being late to a team function. Nowitzki went 7 for 7 from the free throw line and is tied with Jerry West for the sixth-most free throws in NBA history at 7,160. Michael Jordan ranks fifth with 7,327. Magic: F Wes Iwundu and C Kehm Birch were recalled from the G League. Mavericks: Dallas has not lost a season series to Orlando since 1997-98. The final scheduled meeting between the teams is April 4 in Orlando. Magic: Visit the Milwaukee Bucks on Wednesday. Mavericks: Visit the Charlotte Hornets on Wednesday.